Whenever I visit family in New York, there’s a little place that I like to go to called the Great Jones Cafe which, in my opinion, serves up some of the best soul food in the city. Each and every time I leave that place, I always come home to Glasgow, wishing that there was somewhere here where I could go to enjoy dishes like blackened catfish po’boys, eggs jambalaya with cornbread and pulled pork sandwiches with sides of sweet potato fries. The drinks. The Hurricane Skippy (front) and the Louisiana Jam. 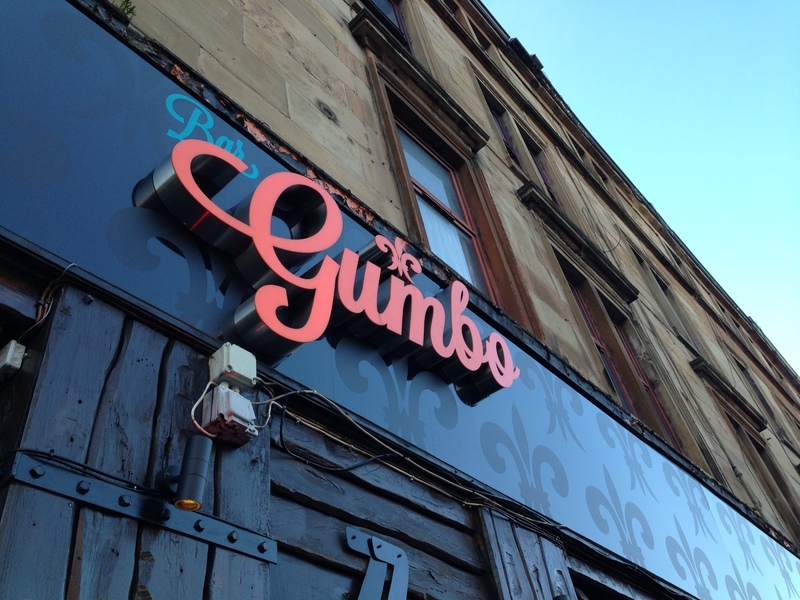 We were very excited to hear about the opening of Bar Gumbo on Byres Road in Glasgow’s west end. A quick scan of it’s Facebook page and some delicious looking photos that had been sent to us by our readers had us hoping that Bar Gumbo would become our one-stop soul food shop here in Glasgow and we quickly made plans to head along for a visit. Inside, Bar Gumbo is split into two areas. There’s a bar and then a restaurant area on the other side. The focus here is on soul food, music and cocktails and you can also find regular live music events at the bar too. The music that you’ll find playing inside the bar is indeed very southern-inspired with a wide range of blues and jazz on the playlist. We started off with some cocktails, which were both fantastic. They were carefully made, well presented and tasted great. The range of cocktails on the menu is very impressive and combined with a solid selection of music, it’s easy to imagine Bar Gumbo being a great place to start off a night out in the west end. The menu consists of everything from plates of beef or chicken gumbo to burgers and po’boy’s to desserts such as deep-fried cheesecake. We decided to go for the chicken gumbo, double pulled pork cheeseburger and sides of hush puppies (deep fried cornbread, below) and grilled corn. Hush Puppies. Deep fried cornbread. 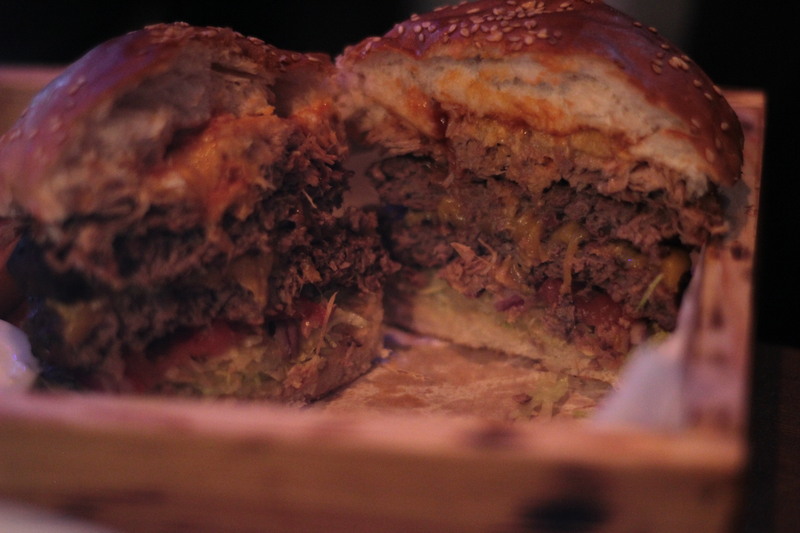 The burger consisted of two beef patties topped with cheese, salad and pulled pork on a toasted bun. The bun came with two onion rings placed on top of the bun too, which we really liked as it meant they were nice and crispy and didn’t disintegrate inside the bun. 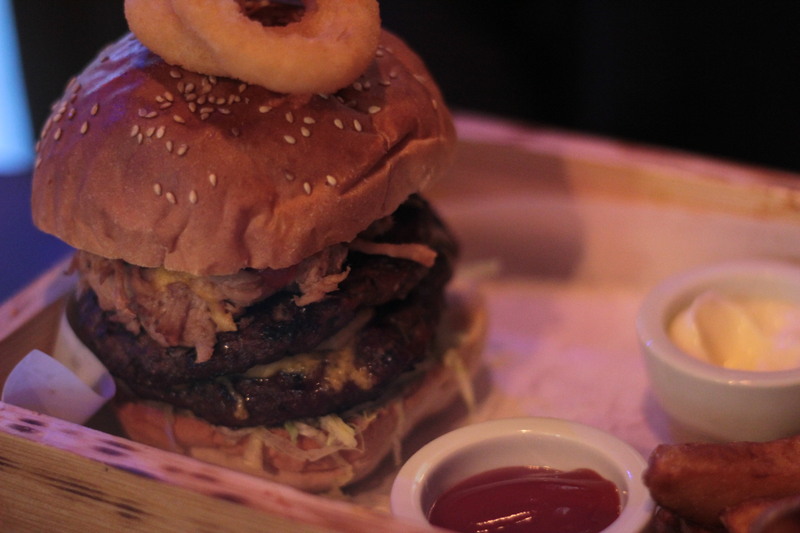 Overall, the presentation was very good – the burger was served in an open-top wooden box with the fries at the side, which added to the overall look and feel of the restaurant. Unfortunately, taste-wise this burger was a bit of a let down. The pulled pork, despite not being the best we’ve had in Glasgow, was good and the hot sauce actually complimented it well. The patties; however, were very dry and lacked flavour. Double Pulled Pork Cheeseburger with added hot sauce. The meat was both under-seasoned and over-cooked and I ended up using some of the ketchup, mayo and hot sauce that came with the burger to try and mask this. The bun did a good job of holding the burger together, despite it being fairly stacked, didn’t disintegrate and tasted fine. Overall, the whole thing was just extremely dry and began to feel like a bit of a chore to eat once I got to the halfway point. It was also fairly cold when it arrived at the table, which was strange seeing as the plate of gumbo that we had ordered was so hot that it burned just to take a bite. After a while, I decided to give up on the burger and just finish off the deep-fried cornbread instead, which was actually pretty good. Even after eating half of the burger and finishing off the cornbread, the plate of gumbo was still so hot that steam was still rising from the plate. The bill came to £33 and for two cocktails, a double burger with fries, a plate of gumbo, a side of grilled corn and a side of cornbread, the price wasn’t actually that bad; however, even with this in mind, I still wouldn’t recommend the food that we had. Bar Gumbo is a place I’d happily go back to for a few drinks, but there are far better burgers to be had in Glasgow that’ll cost you the same amount of money, if not less. 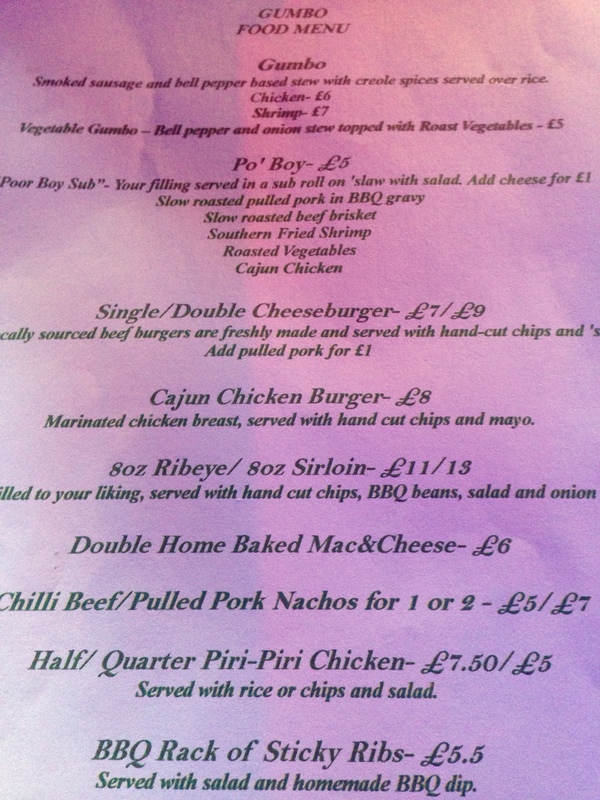 It’s not the worst burger on Byres road (does Charlie still Rock?) but it certainly wasn’t great. 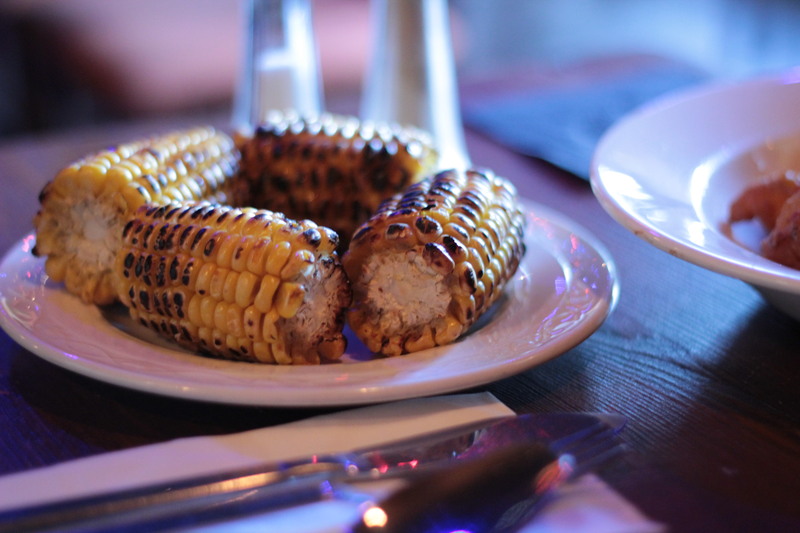 We wanted to like the bar before we even set foot inside and are huge fans of soul food; however, Bar Gumbo sadly falls short of delivering that authentic, warming southern experience. Price: £9 for double cheeseburger (£1 extra for pulled pork), includes fries. + Pulled pork was decent, especially with the added hot sauce but not the best pulled pork we’ve had in Glasgow. + Good presentation. Onion rings placed on top of the burger, rather than in it. + Deep fried cornbread was good. – Patties were very dry. – Lack of flavour / seasoning in the patties. Personally, from my experience in Gumbo the food is great. I’ve not actually tried the burgers, but from your review they seem to be a surprising let-down compared to other items on the menu. I took my partner here for lunch and had a brisket Po’Boy (which was super-tender-flakey-fall-aparty, and well seasoned), whilst she had the mac’n’cheese. As a rule, I ignore mac and cheese on restaurant menus. It seems to be a standard that nowhere can do it right, but this was one of the only times I’ve ever gone back beyond the first bite for the macaroni. It’s worth a shot. 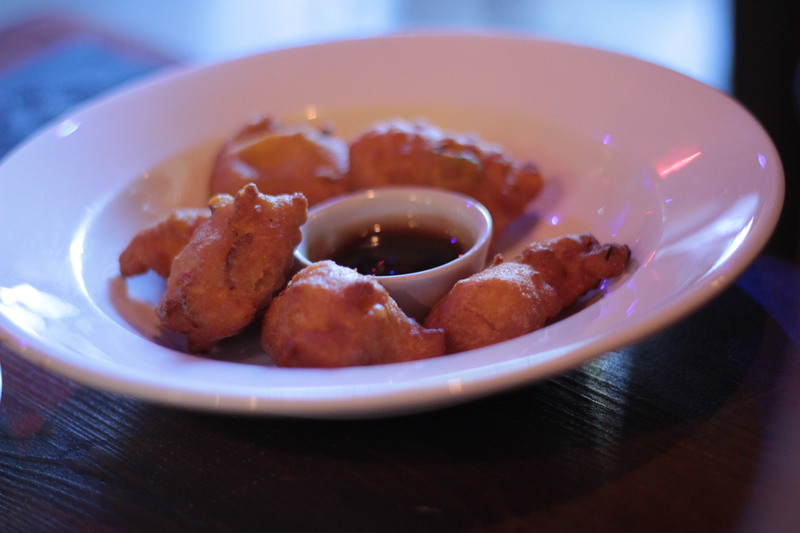 The hush puppies are kickass, a proper ‘drinking’ food, given its wonderful deep-fried, near-cakey, savoury thing they got going on. Easily the best thing on the entire food menu. I’m just surprised the burgers aren’t much to shout about. Come on Gumbo, step it up and play the game! I agree with the above comment – the Po’Boys are great, especially the fried shrimp one (though still not as good as the real thing in New Orleans!). But for me this place is all about the ribs. Simply the best ribs I’ve found in Glasgow so far. The meat almost falls off the bone, the sauce is tasty but not overpowering and there’s not too much of it, and it’s a big portion for the price. I’ve tried the burger as well and thought it was alright, but not a patch on the Meathammer burgers at Nice and Sleazy’s. 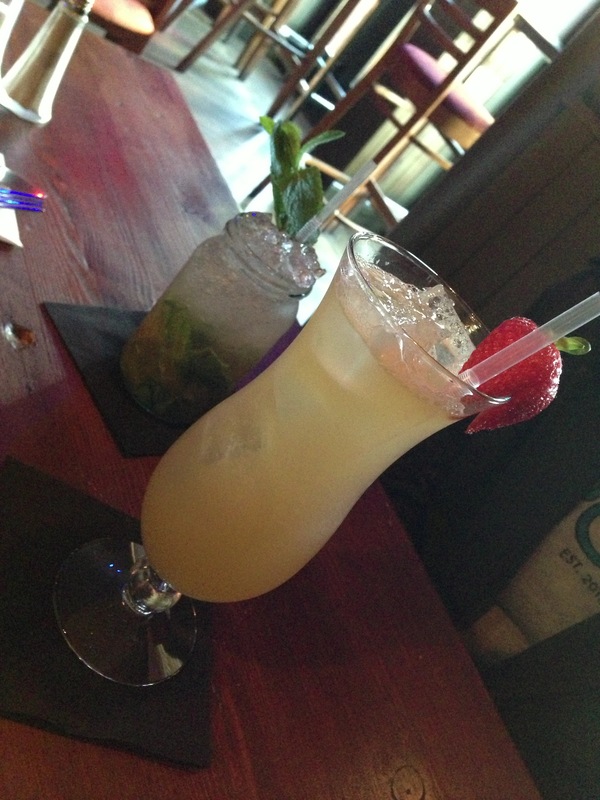 I agree that the cocktails are great as well – the ‘Perfect Strom’ (dark rum and ginger beer, my favourite tipple) they do is the best rum & ginger I have found in Glasgow, mainly due to the home-made chili syrup they put in it. If. like me, you like the Perfect Storm with an extra kick, they will put a bit more chili syrup in on request too. I once got the gumbo (chicken & shrimp, I think) and it was the only disappointing thing I’ve had here. I found it quite bland and gloopy (and, yes, it was served at a magma-like temperature).I might have just chalked in down to “maybe that is what gumbo is meant to be like and it’s just not to my taste”, but I had recently come back from a visit to New Orleans and had gumbo there, and found it to be absolutely delicious, bursting with flavour. I found this a bit strange since this dish is the namesake of the bar – I thought they’d really put the effort in.